College: the romantic transition period from high school to work. Right? Every fall, as summer comes to an end, the media is flooded with images of 18-year-olds and their parents flocking to college campuses, loaded with personal belongings, ready to move into the dorms. The word “college” tends to make people think of young adults, recently graduated from high school, who will be living in residences on campus, studying with friends, and socializing together on the weekends. Individuals who have found and been accepted to the school that is the perfect fit for them. Let the magic begin. Many young adults will have spent the summer preparing for the transition to college by cleaning bedrooms, sorting and downsizing belongings, revisiting memories and reading college student success guides. Transition guides include topics like: 10 things to do to be ready for college; dorm living; tips for classroom success; shopping for the things you will need in college; college and drinking; staying connected; and dealing with setbacks. All things the young adults need to know before striking out on their own for the first time. The 18 year old, recent high school senior is seen as the “typical” college student. However, the student profile for many colleges today is shifting. Young adults with few responsibilities other than college courses are becoming a shrinking demographic on many college campuses. Today’s college classrooms are increasingly becoming infused with non-traditional students, those over the age of 24 with responsibilities beyond the classroom walls. These are not students who transition directly from high school to post-secondary education. Many are first-generation college students whose parents have not attended college and are not providing the students with first-hand information about the inner workings of college. Besides the basic foundational information surrounding college, non-traditional students need help understanding the information regarding the contextual aspects of college systems. What Makes A Student Non-Traditional? Does A Non-Traditional Student Select The Same College Environment As Traditional Student? Data from the National Center for Educational Statistics (NCES) supports the information highlighted in their 2003 report titled Work First Study Second. During the 1999-2000 academic year, 43% of undergraduates enrolled in postsecondary education were age 24 or older. This age is significant because it is used for determining financial independence for Federal Financial Aid programs (fafsa.ed.gov). Financial independence combined with the growing cost of attending college is leading to a growing number of part-time students enrolled in college classrooms. A more recent article in the Wall Street Journal indicates that the number of non-traditional students passed the 50% mark in 2011 (Number of the Week: ‘Non-Traditional’ Students Are Majority on College Campuses). Research provided in 2012 by the Institute for Women’s Policy Research (IWPR) revealed that 51% of college students qualified as low income and would have to work to cover direct and indirect college expenses. The data shows that almost a third of college students need to work 35 hours/week or more while balancing their course loads, homework, and meeting family responsibilities. A little more than a quarter of non-traditional students are parents and 15% are likely to be single parents. The face of the college student is changing, as the data shows: Yesterday’s Non-Traditional Student is Today’s Traditional Student. Financial independence influences attendance patterns and suggests a trend in college selection by non-traditional students. In the Work First Study Second report, 82% percent of the students were employed while attending college and thought of themselves as “employees-who-study” rather than “students who work.” A significant difference between employees-who-study and students who work is how they blend work and college attendance. Not surprisingly, employees-who-study work full-time and attend college part-time; students who work attend college full-time and work part-time. Analyzing the data from NCES around college attendance patterns in the fall of 2013, 4-year colleges, both public and private had over 85% of their full-time student enrollment composed of young adults (under the age of 25). This trend was not true for private for-profit colleges, where young adults represented about 30% of the student population. Students over 24 years old tend to select 4-year private for-profit colleges. At 2-year colleges, the same trend could be seen. Approximately 70% of students attending 2-year colleges, both public and private, were young adults and 30% were over the age of 24. Once again, private for-profit colleges were composed of more non-traditional students. Students over 24 years old made up 53% of their student population. 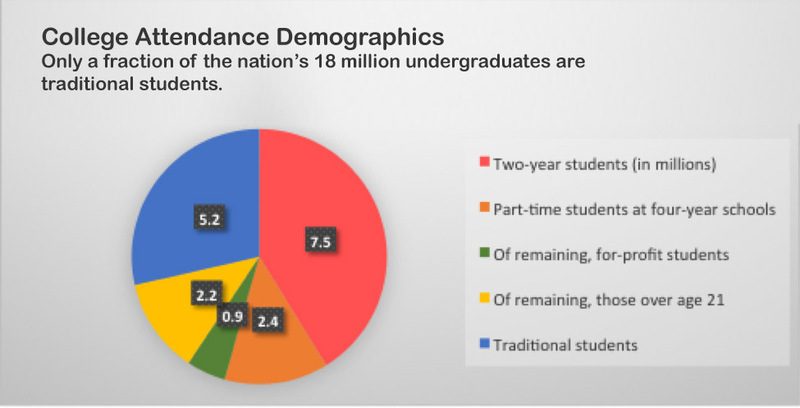 According to NCES data, during the same time period, students over the age of 24 accounted for nearly 50% of the part-time students at public 4-year institutions; nearly 66% of part-time enrollment at private non-profit institutions; and over 75% of part-time students enrolled at 4-year for profit institutions. At 2-year colleges, 45% at public colleges were over 24 years of age. At two-year private colleges, 48% were over 24 years old. At private for-profit 2-year colleges, 65% of part-time students were over the age of 24. Yesterday’s non-traditional students are becoming today’s students and bringing with them a different set of experiences and expectations. Employees-who-study report being interested in gaining skills to enhance their positions or improve future work opportunities as reasons for attending post-secondary education. In the Work First Study Second report, 80% of the employees who work reported enrolling in post-secondary education to gain a degree or credential. Why Do The Demographics Matter? If you talk to people who have gone to college 10, 15, 20, or even 40 years ago, you will hear similar stories about what their college experiences were like. College systems and structural foundations have not changed much from the past. The change that is happening is in the student demographics and their needs/expectations. It is important for students to realize every college has its own culture. Finding a comfortable match between student expectations and college expectations is essential for student success. Looking at demographics can help students think about what type of student needs would impact college selection and how that relates to their individual needs. For example, working students may need more course offerings that are online or have a shorter class session. Working students may have skills from their jobs and feel that they don’t need certain types of classes as a result. In addition, looking at college selection demographics can help prospective students understand there are many roads to college. Ultimately, college is a dynamic equation. Recognizing expectations from the student’s needs and the college’s ability to provide for those needs is a major factor in the student’s college success. A Different Road To College: A Guide For Transitioning To College For Non-traditional Students. Authored by: Alise Lamoreaux. Located at: https://openoregon.pressbooks.pub/collegetransition/front-matter/introduction/ License: CC BY: Attribution. Blueprint for Success in College: Indispensable Study Skills and Time Management Strategies by Alise Lamoreaux is licensed under a Creative Commons Attribution 4.0 International License, except where otherwise noted.